Thank you everybody who clicked in on my poll! It made me really happy to see so many responses to my poll What future topics would you prefer to see on this blog, they’ve been very helpful in planning future directions for this blog! (Overall poll results are here, below the requests I received from the ‘write-in’ request box on the poll form.) . Note, 2015 – This was from a poll I put up in my sidebar a couple of years ago, that I still revisit when I need ideas for the blog. I update this post now and then to ‘check off’ whenever I’ve finally accomplished one of the write-in requests. So it has a lot of updates that are probably only interesting to me! Several of the write-in requests on the poll were for everything—easy and hard tutorials plus history/general interest. I obviously should have included that as one of the poll choices. Thanks for bringing this up, I will put it on the list! It’s a great braid, not mentioned in any of the old loop braiding manuscripts, but known from one actual 14th C. artifact. It would have been made by two people, each holding 5 loops. My workaround method requires holding one loop per finger, including thumbs, like my 10-loop double braids. Update: I just realized that it should be possible to make the Sudarium braid with only eight loops, no thumbs required! This actually might result in a better-looking braid than the 10-loop version (to me, this braid always comes out better when each hand holds an even number of loops). I am raising this topic higher in my to-do list for this blog! In the meantime, the Japanese “genji-uchi” braid of 8 or more loops, and made with hand-held loop braiding rather than fingerloops, is an almost identical-looking braid, and I do have a video plus text tutorial covering it. Video on finishing off a braid. There are many other ways to finish braids, though. Click link for some more tips in a reply to a reader’s comment with a similar request. More tutorials for flat braids. Letterbraid tutorials (“before they die out again”). Turn the header image into an image map linking to instructions for each braid. Actually, the header photo is just a loop braiding blog decoration, not a key to my tutorials. I’ve only made tutorials for four of the header photo braids. The others braids in that photo are too complicated to bother making tutorials for them (see note below). For a description of each braid in the header image, including links to tutorials or any online references, click on the link in my sidebar-→ (just above the tall braid photo). I wish I could use your suggestion to make the header an image map with links to those descriptions, but that is far beyond my abilities! Any sophisticated-looking tech stuff on this site came built-in with this pre-fab, and mostly free wordpress-hosted site, I didn’t do it on my own. A video on braiding longer braids. Ouch!…I’ve tried and failed at this. So far I just haven’t been able to successfully video my whole process of setting up for braiding a long braid, or other fussy non-braiding procedures. I make my braiding videos with my camera sitting on a short tripod on the table in between me and the braid, so I can peer through the viewfinder as I braid–very awkwardly, with my arms wrapped around the tripod-plus-camera. It sort of works for braiding, but not for doing anything fussy that I need to see well, or with long-range and close-up views. I do have a photo and text-heavy post on braiding longer braids. The first and easiest thing to do is to use the ‘start from the center’ technique – it’s a great way to get a (twice as) long braid, with hardly any extra fuss in setting up. As a secondary strategy if I want an even longer than twice-as-long braid, I add my ‘caterpillar’ method – tying or crocheting the ends of each loop up into a dangly ‘caterpillar’ to shorten them temporarily. See my post for photos. This adds time to the setup, but doesn’t add much or any time to the braiding itself. UPDATE nov 2017: Maybe this question might relate to my more recent (in-progress) series of posts on pick-up patterning! Pick-up patterning is a two-color braiding (and weaving) technique in which the braider can decide at every row whether to let the dark or light color show in each loop transfer – so, yes – the braid pattern is under the conscious control of the braider. Within the limits of the braid of course. Usually you follow a chart while braiding rather than ‘freehanding’ this. See: Pick-up 101, Rock Your Square Braid, Flat Braid Pick-up, (more in this series are on the way), as well as The Nun’s Letterbraid, An 18-loop Letterbraid. [Update] After getting this request, I added color set-up instructions for most of the example braids in photos in my earlier posts. Also, I have a new tab in the header menu called Color Patterns that you can click on to see links to all my color-pattern posts. Some of these are not listed on my Tutorials page, if they don’t teach an actual braiding method, just how to set up for various different color patterns. Also, I’ve finally learned a cool html charting format for presenting color-pattern variations! I’m using it on my newer posts. (It’s kind of hard and slow, unfortunately so I doubt I’ll be going back and redoing old posts.) I think this chart format makes the color-pattern instructions easier to scan through and easier to follow. Unfortunately Pdf’s are a totally different format from websites/ blog posts. I had to use a separate hosting site (Scribd) to display my 3-loop photo-tutorial pdf document in a little window on one of my blog’s pages, and I didn’t like the way Scribd then tried to market it without informing me! (this is resolved-I now have a free download link that bypasses Scribd.) I originally wrote that and a few other pdf photo-tutes for the braids_and_bands yahoo list*, for them to post in their “files” section, but I probably won’t be making any more…It’s just too difficult and time-consuming to make photo-tutorials for complicated finger-movements with multiple strands of string in each shot. (planning, taking, selecting, editing the photos takes forever times four, and then you have to lay them all out with text and notice that something is missing that requires ANOTHER photo-shoot which must match the first one seamlessly.) Even with a cameraman—my husband, who won’t do it anymore!—for my 9 and 11-loop photo-tutes, it was hard. Doing it alone for the 3-loop photo-tute was, ahem, let’s just say hellish! 10% — Write-in requests: Many were for “all of the above”, but some were more specific. I listed and responded to them above, along with a few requests from a write-in suggestion box that used to be on my Tutorials index page. If your main interest in loop braiding is in recreating period textiles, I still encourage you to play around with different color set-ups. This was no question also done in the past. Loop braiding was very widespread over Europe and most of the world for (conservatively) many hundreds, and more probably thousands of years—this is better documented in Asia than in Europe (cf Mari Omura). Speiser and Boutrup cite extant examples of very complex European loop braids made by two or more braiders that go back as far as the 11th C. In fact Part IV of their European Loop Braiding monographs has a picture of an elegant purse with loop braided handles from the late 900’s! Narrow textiles just don’t survive much longer than that in Europe… Doesn’t mean they weren’t made earlier than that. The knowledge was not restricted to specialized guilds or classes of workers, though these certainly existed at various points. Hand-made braids were daily necessities as well as ornaments until the industrial revolution—for tying, carrying straps, and connecting just about everything, including clothing. It is a natural human tendency to try to make necessities beautiful! And to improve them over time. In Part IV of Noemi Speiser and Joy Boutrup’s recent European Loop Braiding publications (based on their exhaustive research in museums and private collections), they state that almost ALL (textile) braids of extant European artifacts that they have seen which were made prior to the advent of braiding machines (and some even after) were loop braided. Yes, even long braids! In past eras, enough people knew how to loop braid that it would be no problem to whip off a long braid—one person holds the top and tightens, the other stands at the end and does the braiding moves. In this youtube video of Wayuu textile craftworkers of Columbia, South America, move the timeline “bubble” to 2:25 to see two Wayuu women cooperating in loop braiding an extra-long braid. It is very unlikely that European loop braids were restricted to the surviving written instructions in a very few 15th C. English household manuscripts and 17th C. upper-class ladies’ workbooks. Especially in regard to differences as superficial as specific color patterns. A 5 to 10-loop braid of any given structure actually has relatively few possible color patterns, especially braids of only two main braiding moves (like square braids). I think it’s near impossible that they weren’t all exploited in all the centuries that people have been braiding with dyed fiber. In fact, even though not many braids have have managed to survive intact from medieval and earlier periods, the few that do include several loop braids that are very different from the braids described in the known loop braiding manuscripts—that is, in having a different braided structure, which is much huger difference than a color-pattern variation. 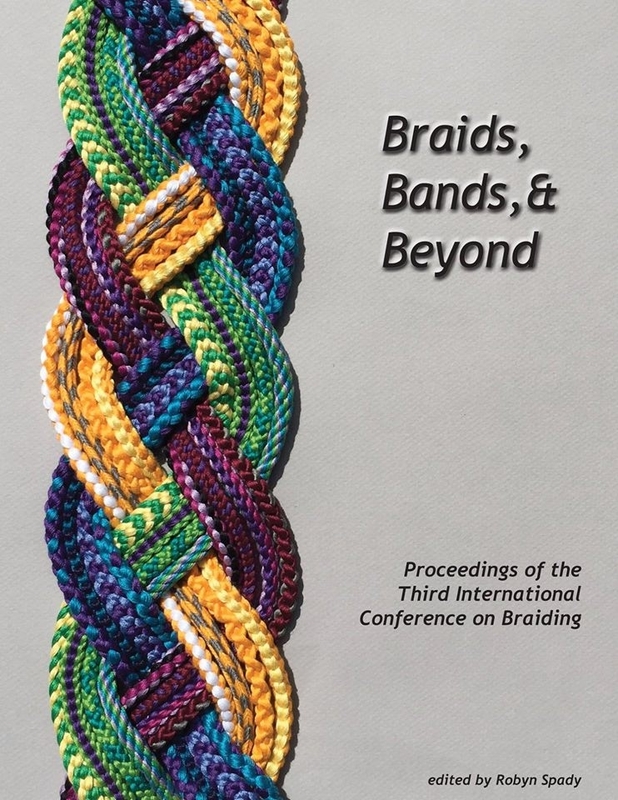 For making period-accurate braids, to me it would make more sense to study the types of fibers, yarns, and shades of colors that were available in a particular period, and learn about the wide range of loop-braided structures and possible color-patterns for them that can be reasonably and logically inferred to have been made. For example, square and flat braids of 3,4,6 and 7 loops, even though they didn’t happen to be transcribed in the known documents – it is impossible that they were not well known. They are completely obvious on the basis of 5-loop square braids to braiders at the levels reached in those eras. The writers of those few known manuscripts would hardly consider it necessary to notate other square braids after notating the 5-loop ’rounde’ braid. Same thing for every possible color pattern that could be made with them. Getting across the basis of the structure (along with the possibilities opened up by using bicolor/ “departed” loops) opens up an easily-accessible range of possible color patterns that wouldn’t need to be independently notated. In my opinion, that approach would result in a more accurate representation of the richness of earlier periods than the continual reproduction of the same few “documented” color-patterns, in fibers not appropriate to the period, like (chemical-dyed) cotton (cotton was not available in Europe until relatively recently) and spun silk. Spun silk is the type of silk thread mostly sold today, and it is very different in construction and appearance from reeled/ filament silk (not only reeled, but usually not even twisted/ ‘thrown’ – more like floss bundles) that was used ‘in period’ — though only by those few people who were rich enough to afford silk, and likely only for a small percentage of all their braided cords, accessories and trims. In Europe, wool and linen were common, while silk was rare. Beautiful, fine textile work and intricate color patterns are not just the hallmark of the richest class, either! – just think of peasant textile traditions throughout European history! Most of the braids in the header are a lot more complicated to make than the ones I’ve made tutorials for so far. It’s been several years, and I still haven’t heard from anyone using my 11 and 13-loop tutorials, so for now I’m not planning on making tutorials for even more complex ones. To tell the truth, this has been a hard thing for me to get over and keep my incentive up for working on this blog! My original motivation for starting this blog was to connect with other braiders and share my “too-many-loop” braiding techniques. To me they seemed like the main thing I could contribute to the information that was already available on loop braiding. The first and most basic technique that hadn’t been taught yet online was the V-fell style of braiding: using the little finger to pull loops instead of the index finger, because that method allows using the thumbs as well as fingers to hold loops — as taught in my 9-loop square braid tutorial. (there’s no particular advantage to using either the V-fell or A-fell method when braiding with 7 or fewer loops.) So it turns out a lot of people have used my 5 and 7 loop V-fell tutorials, but it just doesn’t appear that many have gone on to “too-many-loops”. This is still good, I have to remember! It’s a good thing if a few more people have gotten into loop braiding because of these tutorials, even if they weren’t interested in putting loops on their thumbs! So, anyway, there are a lot of great braids that can be made without using extreme numbers of loops, including many that aren’t described anywhere else, so I think I should focus on those here, more than on the ones with “too-many-loops”. If you do want to learn “too-many-loop” braids, go down my Tutorials index, and learn the prerequisite braids in order of difficulty…If you practice them, the learning curve is fairly fast. But it’s one step at a time, it doesn’t work to try to make a 13-loop braid before you can braid with 11 loops. (Ask me how I know! 🙄 ) And please, please do let me know if you’re learning any of my “thumb” braids, that would definitely encourage me to make more tutorials for them! Kute Uchi and Andean-style hand-held loop braiding are other ways to make loop braids of many loops. Finger loops have some definite advantages over hand-held loops in security of loops, automaticity of braiding moves, and even tensioning—for braids of up to 18 loops or so. But it’s also possible that I am biased! You might find hand-held loops a great option for making ‘too-many-loop’ braids. I made my 3-loop braids pdf-format tutorial for the Braids_and_Bands yahoo discussion site originally, where it’s hosted in their “files” section, along with some other pdf-format photo-tutorials of mine, mostly on spiral braids. See my 3-loop tutorial post for info on how to download them from Braids and Bands (this info is in a note near the end of my post, below all the videos; it’s not in the pdf document itself).